Getting into the holiday spirit? We sure are, and this guy definitely is too. 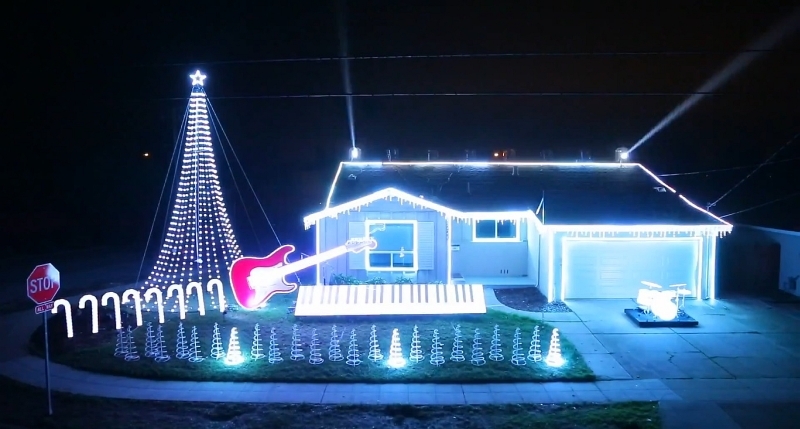 Around this time of year, we usually see the overzealous few put on spectacular lighting shows to annoy their sleeping neighbours and drive their electricity bills skyward, but this is taking it to the awesome extreme. Instead of the customary Santa, Rudolph and company we expect to see in December, this bloke has gone with a more interesting theme — Star Wars. That’s right, even the Sith is allowed to celebrate Christmas. Covering his house and front garden in over 100 000 lights and using 12 500 lighting channels to control them all, the entire display is choreographed to the equally visionary Star Wars soundtrack. The entire musical ensemble is complete with rather authentic looking instruments, from a keyboard to a drum kit and and electric guitar — an ode to the creator’s day job. “This is now my second year decorating,” notes Tom BetGeorge, the genius behind the concept. I built all the props using wood, metal, acrylic and corrugated plastic. I am a music/teacher director for a living (COVA Conservatory in Oakland and Centerville Presbyterian Church in Fremont), hence the massive instruments! If you look closely (especially during the Cantina song) the instruments are playing the real notes! The beams can be seen for miles but I went out of my way to avoid shining the beams on houses and flight paths. If you happen to find yourself in Newark, New Jersey, USA at this time of year, you can see Tom’s defiance of the Dark Side in person, but if you happen to be a million miles away on a distant galaxy (or at work), stand by for five minutes of glowing Christmas spirit, Star Wars style.